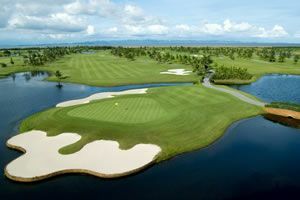 I can’t think of a golf course I’ve played in Bangkok that doesn’t have some kind of water hazard running through it…. In fact there is generally some kind of hazard on every hole! 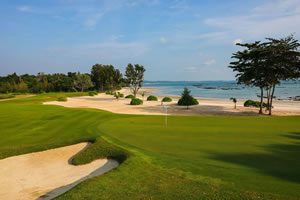 Playing at Panya Indra one scorching hot Sunday afternoon in November our group reached the 537 yard Par 5 third hole on the C Course. It was going to take two cannons to reach the elevated green! A tough drive with OB down the right and a lake down the left. Having bombed one I thought I would try my new 3 wood off the deck and go for the ‘two on’… (Caddy told me to lay up with a 6 iron) Not a chance! She obviously wasn’t impressed with my bogie, par start! A low thin swerving neck shot ran up towards the stream around 20 yards short of the green and dropped nicely in and this is where the fun starts! 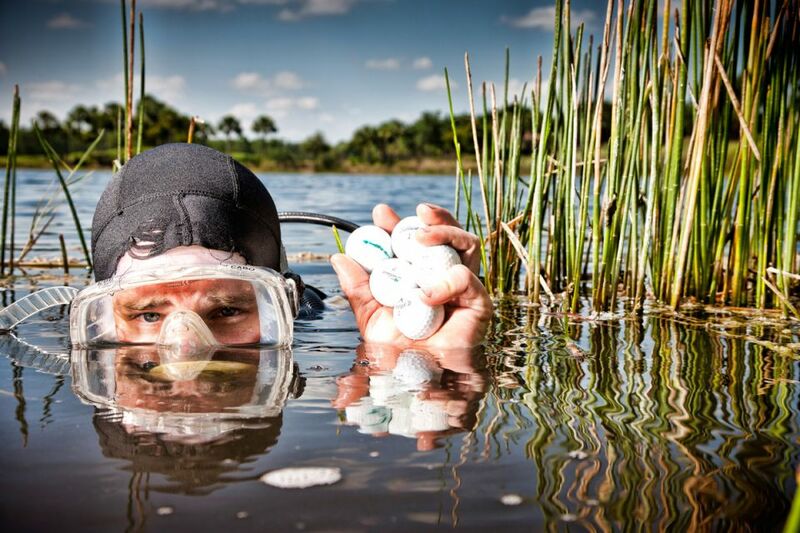 This isn’t one of those water hazards where you can find a guy swimming after your ball as soon as it’s gone in! This is where the rules bit come in! Rule 14-6 Moving ball in water (I’d never heard of it until this shot). We could see the ball in the clear water and as my caddie was about to scoop it out my playing partner from the UK (Absolutely loves a ruling) shouted over “Oi stop right there” I thought he’d spotted a massive monitor lizard! The ball was moving with the current of the water and hadn’t come to rest yet. I knew where this was going but hey it’s match play and I’m one up so why not! He explained that rather than take a penalty stroke you can without penalty hit the ball while it’s still in motion. Or try to at least! A rare occasion where you can hit the ball while it’s still moving! There is however one small exception to this rule! So….shoes off, socks off I tiptoed in with my lob wedge ready to give it a whack! I had about 5 seconds before the ball would reach a rock bigger than my golf bag! The water is only just above the ball and the water not moving like the rapids in a theme park so I’m confident! One hit, one dented wedge and one rock later and I’m 20 yards back down the fairway having nearly taken out my far from impressed caddie! No penalty and I’m pitching on for four so not too bad and still in the hole with my partner on for four. I swiftly thinned that pitch over the back into the sand, dumped it out and lost the hole making a seven!